The crab pattern looks very similar to the Butterfly pattern. Except that it has an incredibly long CD leg. This pattern is often followed by sharp and volatile price action. So it’s very important to anticipate higher volatility when executing your trades at the pattern completion point. The price usually approaches the pattern completion point very aggressively. And it might look like the price’s gonna pierce through the completion point, and invalidate the pattern. But as you’re gonna see in the examples below, if the pattern is valid, the price will actually reverse extremely fast upon testing this zone. 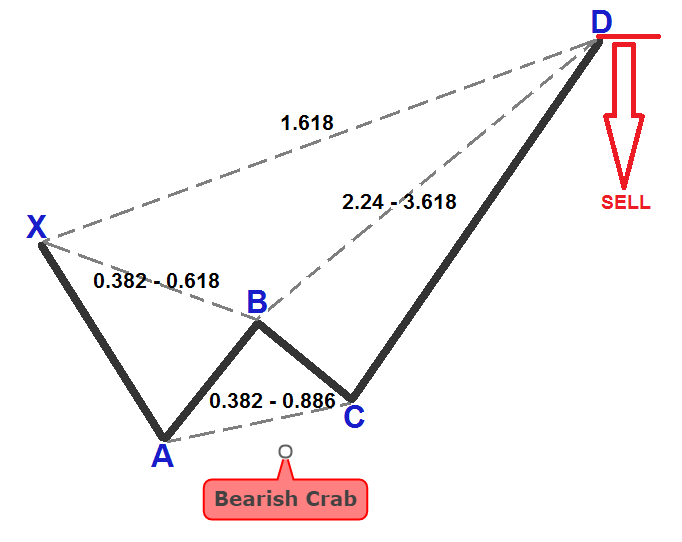 The B point of a typical Crab pattern ranges from 0.382 to 0.618 retracement of the XA swing. BC = 0.382 to 0.886 retracement of the AB leg. CD = 2.24 to 3.618 extension of the BC leg. And CD must also be equal to 1.618 extension of the XA leg. Point D represents the completion point of the Crab pattern. Once the pattern is completed, a trader could be looking for a buy or sell opportunity at point D. With a profit target of 61.8% – 127.2% of the CD leg. In the examples below, I’m gonna use our own proprietary Harmonic Dashboard indicator that does all the hard work for you and identifies valid Crab patterns that follow the correct Fibonacci ratios. 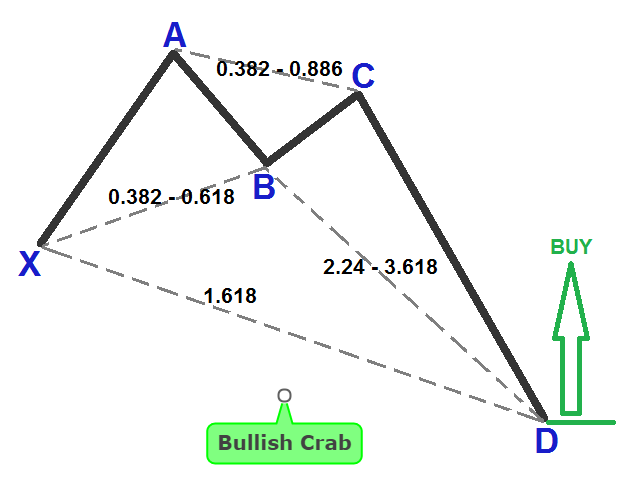 We’re gonna enter at market price, immediately at the open of the next candle once the Crab pattern is established. And we’re gonna target the 0.618 Fibonacci retracement level of the CD leg. Our initial stop loss is placed at 3.618 extension of the BC leg. And once the market starts moving in our favor, we move our stop loss to the completion point D.
In this example, we have an almost-perfect bullish Crab pattern with point D just below the ideal 2.24 extension of BC, and also just below the ideal 1.618 of XA. Notice the high volatility at the completion point of this pattern as the price attempted to push below point D.
One of the pitfalls of the Crab pattern is that it requires a wide stop loss. But this issue can be solved by trailing your stop once the trade starts to move in your favor. In this example, we moved our stop to just below point D.